The date the report was last updated is included so you can see when reports are out of sync with changes made to the dataset. It’s also useful if you archive analysis reports and need to know when the analysis was performed. For brevity Analyse-it shows only the date, but the cell also contains the time of the last update to the report. To see the time, click the cell containing the date to activate it, and then look at the Excel formula bar to see the time (see screenshot above). To aid traceability, Analyse-it includes the name of the user who last updated the report. 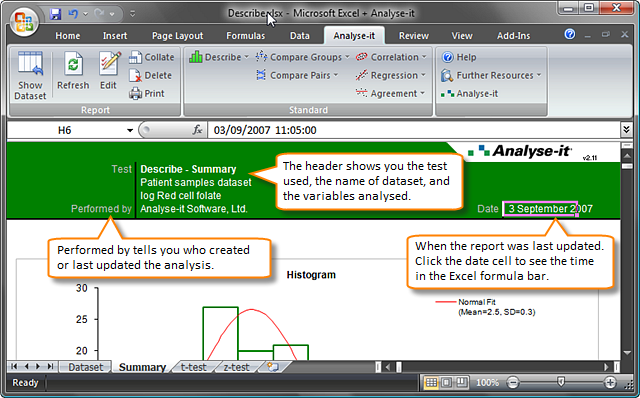 Analyse-it gets the name from the Microsoft Office user name. The user name shared among all Microsoft Office applications, including Word, Excel, and PowerPoint. Office applications use the name to identify changes in documents, and store it in the document properties to identify who created, last edited, or modified an Office document. Analyse-it includes the name in the report header so you can quickly see who last analysed the data, should you need to contact them. In Excel 2007, click the Office button at the top-left, then click the Excel Options button. In Excel 2003 and earlier, choose Tools > Options from the Excel menu bar, then click the General tab. Enter the User name. You can enter your name, department, group or company name, depending on how you want to be identified in the reports. Click OK. Analyse-it reports will now use the new user name. If a few users share your PC, and each have a separate Windows user accounts, each user can set their own Excel/Office user name. Simply log-in to your account and then repeat the steps above. When we first developed Analyse-it, we did consider using the name of the Windows user currently logged-in. The problem is Windows account names are often first names, nicknames, or are abbreviated, and so aren’t ideal to clearly identify the person responsible for the analysis. It's also be difficult to change the name associated with a Windows user account, especially if you work at a large organisation where you need IT support to do it. For these reasons the Office/Excel user name is ideal. A few consultants using Analyse-it in their work with clients have asked if they can include their company name in the reports, or brand the reports with their company logo. You can enter your company name as the Excel user name, as we did for the screenshot above. Including a company logo is more complex, but is something we will consider if there are enough requests for the feature. Post a comment and let us know what you would like to see in the report header. We’ll do our best to include any requests in future versions of Analyse-it.